Manchester City assistant coach Mikel Arteta has revealed he is surprised by the tag placed on Man City as a favourite to win the Champions League this season. Manchester City is still on a bid to win the Champions League and this season they can run for it again. Due to the quality of players they have and how well they perform in the Premier League last season, many Champions League followers have now tagged them to win the biggest European trophy this season. 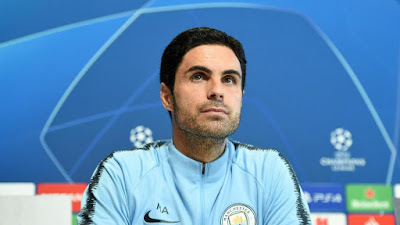 Mikel Arteta who will oversee City game on Wednesday against Lyon due to Pep Guardiola suspension has now accepted the challenge and also claim it won't easy as people think and that he sees Real Madrid as the top favourite. Speaking in a press conference ahead of their game against Lyon, Arteta spoke about Real Madrid and the departure of Cristiano Ronaldo and also about City's chances of winning the Champions League. Arteta also dismissed the saying that Manchester City are favourite because of their big spending. Manchester City takes on Lyon at the Etihad for their first Champions League game of the season on Wednesday.